AS the classic song "We are the champions'' ignited the elated crowd, Ipswich fans launched into one of the city's biggest sporting celebrations in history. Western Pride had just elevated Ipswich to its highest heights since the Jets won the 2015 Queensland Cup rugby league competition. However, Saturday night's incredible 2-1 victory over Moreton Bay United was something special. It ended a 31 year drought in one of the city's most historically important sports. 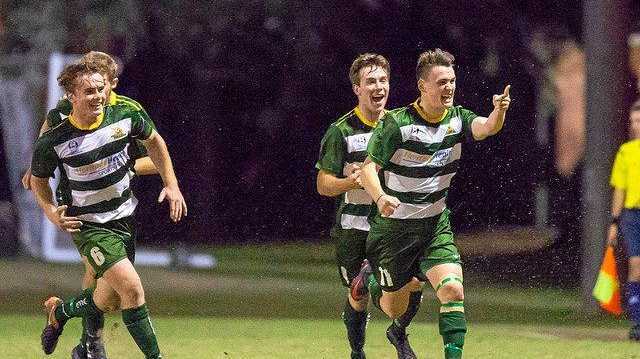 Western Pride are the National Premier League champions of Queensland after surviving a dramatic finish at the Briggs Road Sporting Complex. The last time an Ipswich representative soccer team won a major grand final was when Coalstars beat North Star 2-1 in the 1986 Brisbane Premier League grand final. Saturday's scoreline was the same, only far more important being on Ipswich soil by a young and exciting team that could one day carry an Ipswich-based side into the A-League national competition. Western Pride general manager Pat Boyle was briefly speechless with emotion before explaining what the result in front of 3383 fans meant. "How good is this for Ipswich,'' Boyle said. "I'm just so glad to be a part of this. "We knew it's been there for a long time and now they've gone 'Ipswich is here'. Newly-elected Mayor Andrew Antoniolli and football fanatic councillor Dave Morrison shared the occasion as Ipswich City Council had played a major role in helping Western Pride secure a state league licence five years ago. "I promised during the campaign that I'd deliver Western Pride a win,'' Cr Antoniolli grinned. "It is great for the city because this is equal in many respects to when the Jets won. "This is one of the most professional NPL clubs in the state, if not the country, so for them to win tonight, it's a reward for their effort. Cr Morrison has long supported football's development and progress in the city. He was a picture of satisfaction as he mingled with Pride's players, officials, coaches and fans. Western Pride led tonight's grand final 1-0 at halftime through a superb goal mouth finish by defender Cameron Crestani. However, Moreton Bay United had the big crowd on the edge of their seats after scoring with just minutes of normal time left. It was up to Western Pride's goal specialist Dylan Wenzel-Halls to nail the winner with seconds of regular game remaining. His free kick created scenes of jubilation at the Ipswich venue as fans rushed onto the field. The celebration continued into the night with players, official, coaches and fans getting their photos taken with the NPL Cup that has a new home in Ipswich.